ENCINITAS — Construction crews with the San Diego Association of Governments closed in on finishing the San Elijo Lagoon Double Track Project today by re-opening the Chesterfield Drive rail crossing in Cardiff by-the-Sea. Those improvements include the Chesterfield Drive crossing, which received improved and additional rail crossing signals and gates, an Americans with Disabilities Act-compliant sidewalk with ramps and a multi-use bikeway and pedestrian path. According to SANDAG, the improvements will aid bike and pedestrian safety and comply with the city of Encinitas’ quiet zone in Cardiff-by-the-Sea, which allows train engineers to forego sounding the train’s horn when approaching the intersection. The project is part of SANDAG’s larger Build NCC (North Coast Corridor) program, a 40-year, $700 million effort to repair and expand vehicle and rail transportation infrastructure throughout San Diego County. 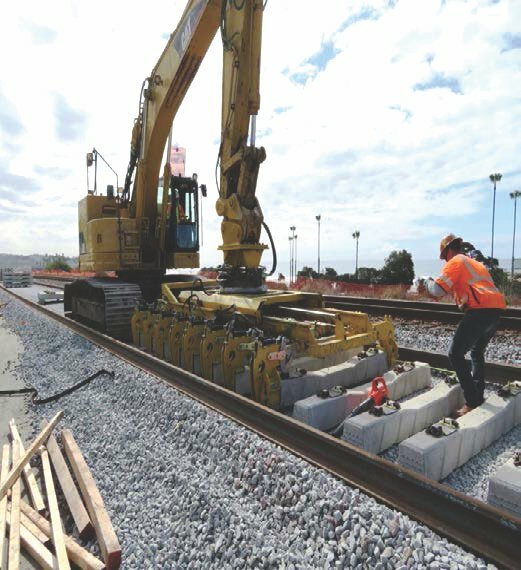 SANDAG officials and work crews expect to finish the San Elijo Lagoon Double Track Project some time this spring.